Aluminum iPhone docks aren't on short supply. In fact every new dock out there is made from the stuff. We've seen plenty of amazing iPhone 5 docks recently, but none are as Apple fanboy-girl-dedicated as this one. 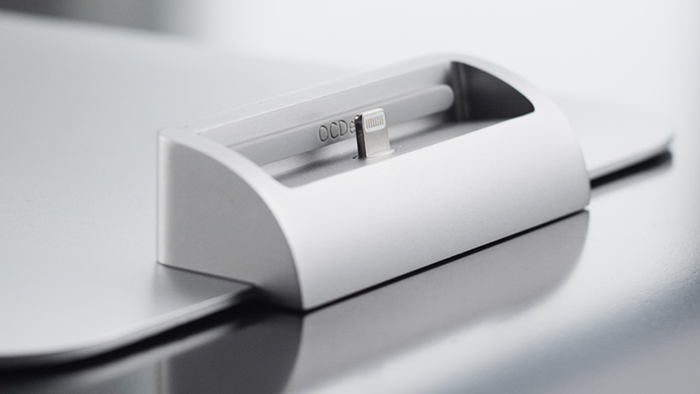 The $79 OCDock by OCDesk is a the one and only dock made exclusively for Apple fanatics. It's a dock with a svelte aluminum build, finished off with a bead blasted Apple finish which is designed to seamlessly sit at the footstep of your iMac or Thunderbolt Display where it'll play its part in solving your first-world problems of a clutter desk environment. Plus, it'll charge up your iPhone 5 in absolute minimalist, wireless-looking style. You see, the OCDock was designed with the world's thinnest cable which means it can sit vistually against the aluminum pedastal of the Apple Display while the thinner ribbon USB cable is routed underneath the base of the display. The OCDock will fit most protective cases thanks to the three different interchangeable silicone support inserts, and features a bevy of features like the all desired one-handed undocking and a patented spring-loaded charging plate that slides up or down to reveal more or less of the Lightning connector depending on the bulk of protective case you have on your iPhone. So when they said this dock is compatible with most iPhone cases, they really mean it. The $55 OCDock Mini is an even slimmer version of the standard OCDock for those who prefer to use their iPhone naked, and keep it that way. If you're looking to get an amazing iPhone dock to compliment your iMac and Apple Thunderbolt Display, you've got to be a fool not to pre-order the OCDock. A fool! The OCDock and OCDock Mini are both available to pre-order on Kickstarter in either matte silver or black finished aluminum. If you've got an iPhone 4/S, the OCDock is also available in a 30-pin charging connector model as well. Everyone wins, except for Android and Windows 8 users. Thanks for the tip, Peedu & Chris! Update: The OCDock is now available to order directly from Bitemyapple.